I made this Kosha Chingri Macher Kalia last weekend with some steamed rice and curry leaves tempered musur daal. He finished the lunch (read there wasn't any meat curry, not even leftover) with a big smile, that too on weekend. 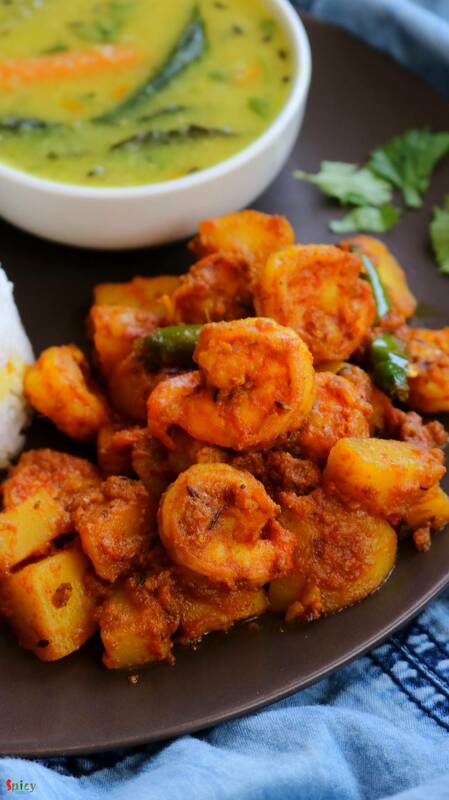 This spicy prawn curry worked like a magic. 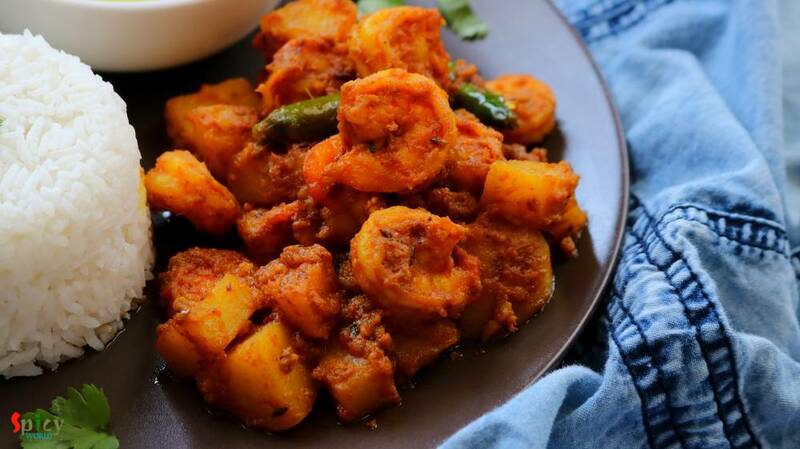 So, I had to share with you all the recipe of this Bengali delicacy - kosha chingrir kalia. 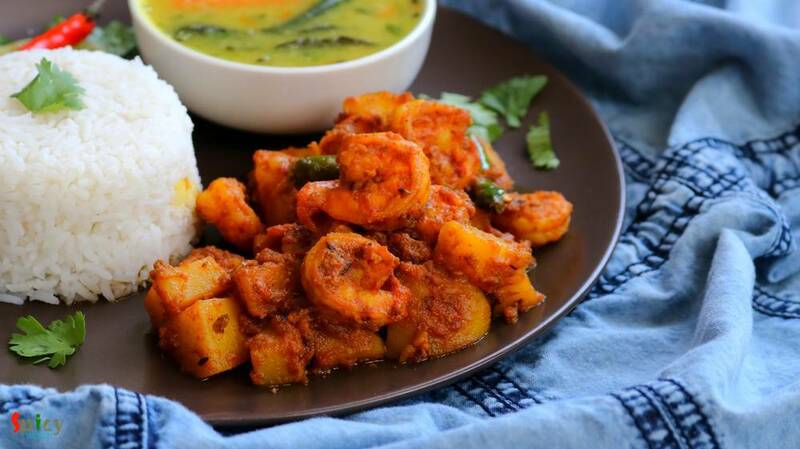 Though the word 'kosha' suggests slow cooking which we are not gonna do with prawns otherwise they will come out rubbery, but also suggests a dry (oily) and spicy gravy and in this recipe we will go with the second variety. Hope you will find the recipe interesting with the detailed video. 10-15 pieces of big size prawns (deveined and cleaned). 1 large tomato, grated or pureed. 1 Tablespoon of fresh ginger garlic paste. 1 big potato(peeled), diced into small cubes. 1/4th Teaspoon of cumin seeds. 1 Tablespoon of turmeric powder. 1 Tablespoon of red chili powder. 1 Teaspoon each of roasted cumin and coriander powder. 5 Tablespoons of mustard oil. 1/4th Teaspoon of ghee (you can use more). Do the same with potatoes. In a small bowl add all of the spice powder, ginger garlic paste along with 3 Tablespoons of water. Mix well, keep aside. Heat 1 Tablespoon of oil in a pan. Add the prawns and fry on high heat for just a minute. Then take them out and add another Tablespoon of oil in the same pan. Fry the potatoes in that oil for 2-3 minutes, then take them out. Now heat the remaining oil. Saute bay leaf and cumin seeds for few seconds. Then add the spice mixture and cook for 2 minutes on low flame. Then add grated tomato along with some salt and cook until oil separates. Add the fried potatoes, mix well for 2 minutes. Then add hot water, cover the pan and cook until the potatoes become 80% soft. Next add the fried prawns and green chilies, mix well and cook for 2-3 minutes on low flame. When the gravy becomes thick add ghee, mix well and turn off the heat. 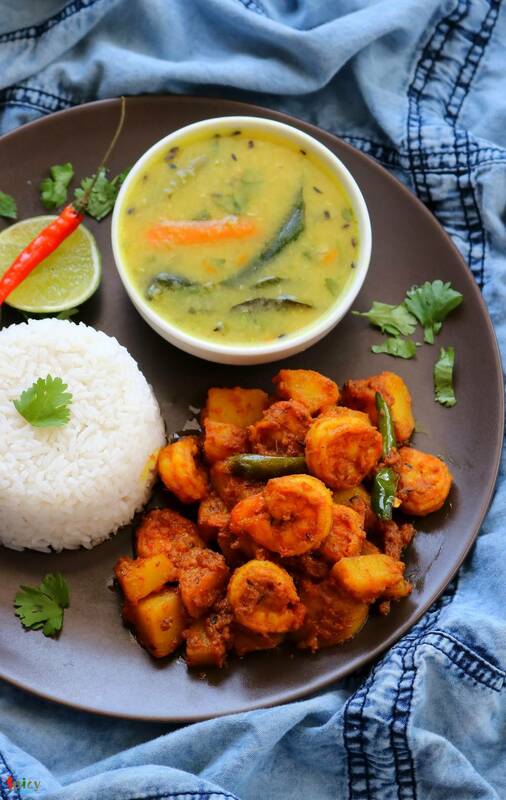 Your delicious kosha chingri macher kalia is ready.